Using natural materials with children has many benefits. It saves the earth and our children from being exposed to numerous chemicals and synthetic materials. 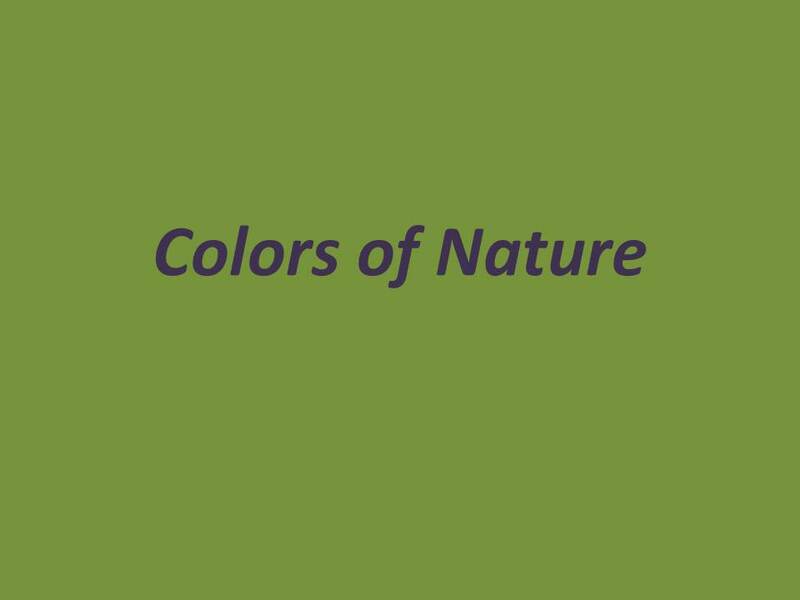 But natural materials provide a sensory experience that taps into all of our senses – vibrant colors of the world, scents and tastes of gardens, and textures of the elements. Recently my cooperating teachers used berries to stain birdhouses with the children. They turned out fab! Which led us to provide the children with the opportunity again while hosting a plot at the Children’s Fest for Day of the Young Child. Up-cycled fabric canvases were used with berries, beets from our garden, ground coffee beans, and herbs. 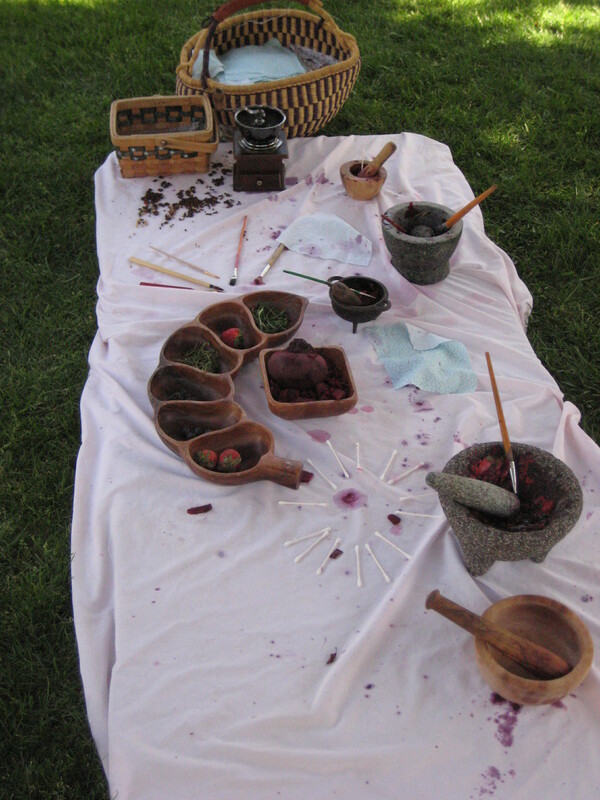 The children crushed their own colors with mortar and pestles (don’t ask me which is which, is the mortar the bowl or the grinding tool!). Then they dabbed their brushes in, pushed fabric right in the bowls, or dipped their bare fingers in and smeared away! Nature as our provider of beauty for art rich experiences! Wonderful! 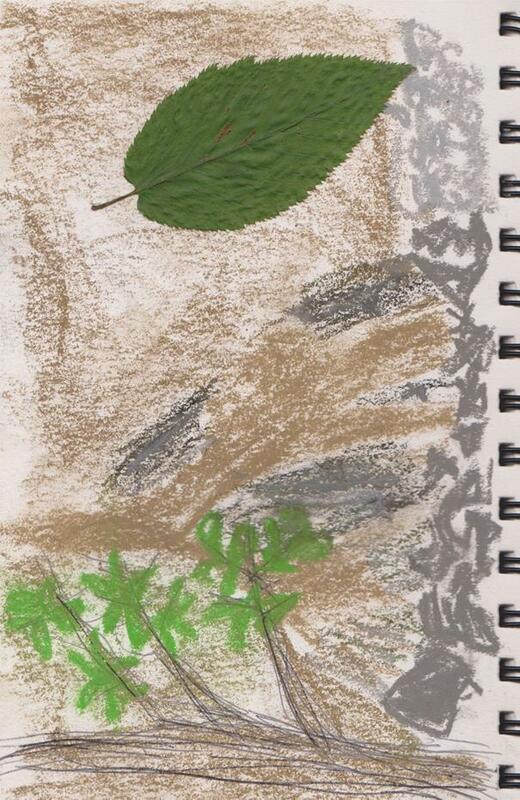 A journal during any season is a great activity to add to a nature walk of hike. Your child may just draw pictures at first and then add words as they progress. If your child is not a writer yet try creating a scrapbook of collected materials and pictures. Even preschoolers can take great pictures after a little lesson in gentle care of a camera. You will be amazed at how the world looks in their eyes! Snowflakes are fun to catch on black paper and then draw with a white crayon! Leaves can be collected and dried. Pine-cones can be used for painting (roll in paint like a rolling pin and then on paper) or for bird feeder creations. 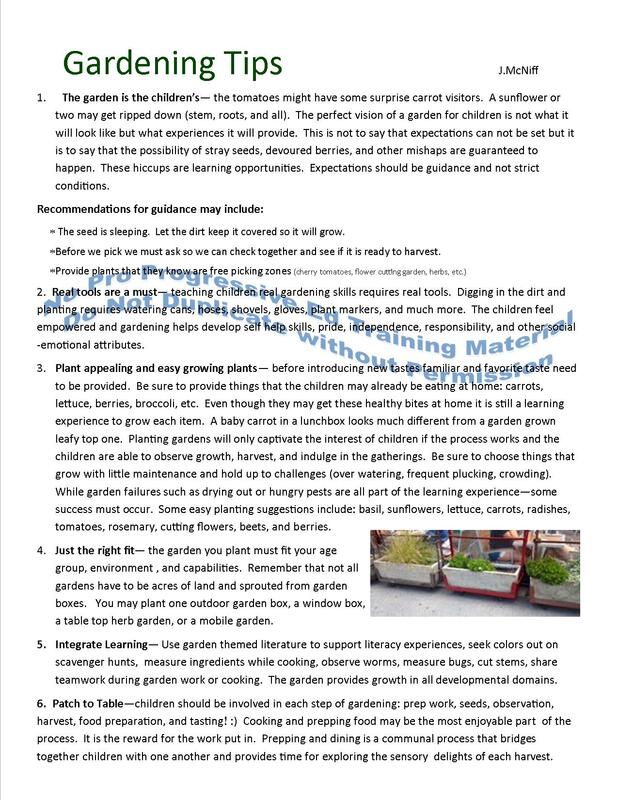 Whether in a spacious outdoor landscape, in a flower box, or in a collection of planter pots – it is critical to expose children to the process of growing a garden. Children experience many benefits from growing their own harvest. The natural environment gives children a place to practice their social skills; “green space fosters social interaction and thereby promotes social support” (Louv, 2008). When children have daily opportunities to care for plants and trees, animals and insects, they practice nurturing behaviors that help them interact in kind and gentle ways with people as well” (Louv , 2008). How these interactions pan out can mold their capacity for empathy, kindness, turn taking, conversation, understanding of consequences, and other social skills we strive to foster in our children (Louv, 2008). Recently I attended a workshop The Atelier of Taste: Exploring the Language of Food hosted by Branches Atelier. 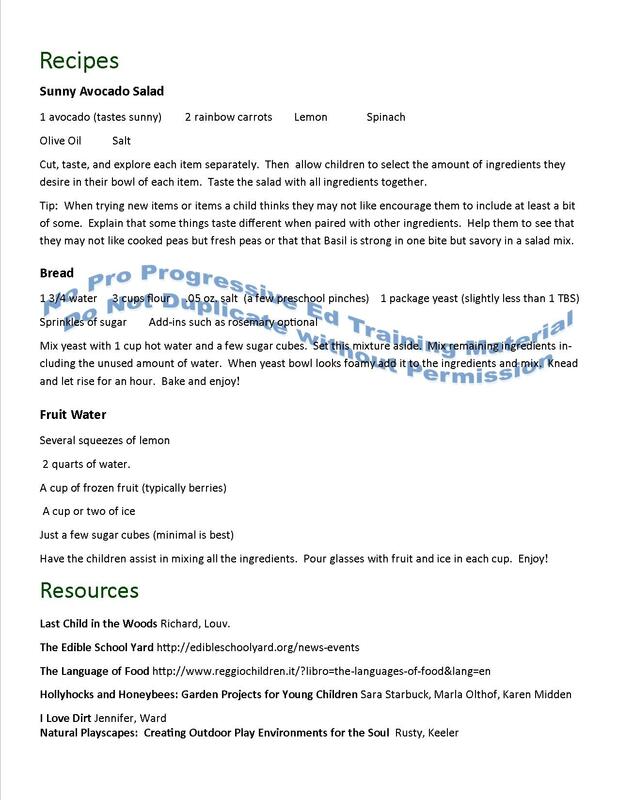 This workshop highlighted tasting food (especially natural foods from gardens and farmer’s markets) as one of the 100 languages children possess. To think of taste as a language opens our minds as educators to a whole new world that children have the right to experience. When the children are a part of this process of preparing/cooking and then eating the foods the desire to be a part of the tasting is much more appealing. It no longer is about the strange pepper sitting in front of them but about the pepper that they helped cut. Preferences suddenly expand! Children get to learn about the life-cycle in a hands on way. They are a part of the process: seed, sprout, plant, fruit or flower. Children have the opportunity to have ownership over a place in their environment. 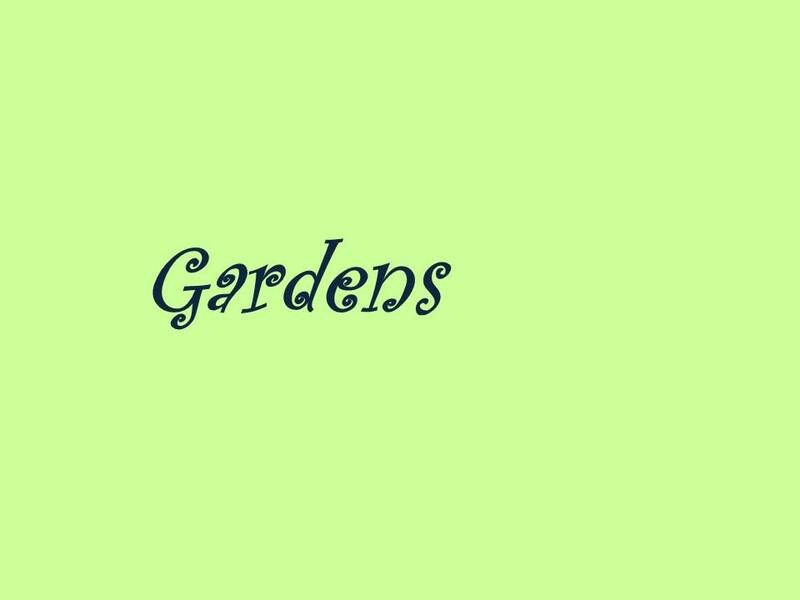 They must tend to the garden for it to flourish. Watering, weeding, planting, harvesting are all tasks that must be completed. These tasks have benefits of their own (fine motor skills, conservation, problem solving, cause and effect, etc.). Resource: Louv, Richard. 2008. Last Child in the Woods: Saving Our Children from Nature Deficit Disorder. Your home herb garden can inspire cooking adventures! 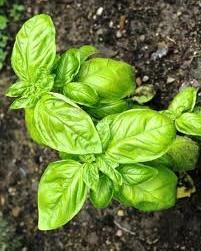 Let your child help cut or pluck leaves from the Basil plant for this recipe. 1. Rinse and cut basil. Set Aside. 2. Blend pine nuts (for extra flavor toast in oven on a cookie sheet first) and garlic with oil in processor or blender (perfect time for a little helper to push the button). 3. Add basil, lemon juice, and cheese. Continue to blend until a smooth paste forms. 4. If you have a mortar and pestle then scrap the processor and allow your child to crush up all the ingredients together for a homemade pesto with a bit more texture. 5. Serve heated or at room temperature on your child’s favorite shaped noodles. Be sure to serve a light amount for your child. Pesto is a strong flavor. 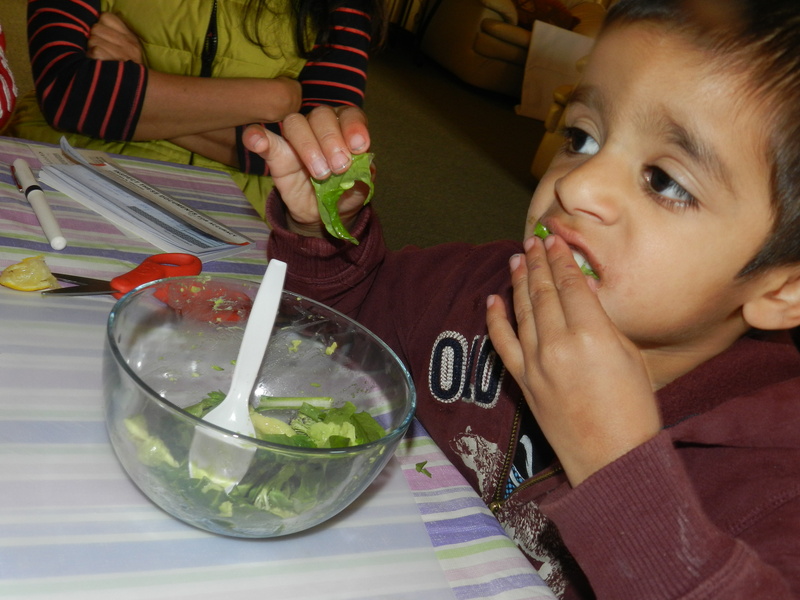 If introduced the right way your child may love the new taste that pesto brings to their pasta! Get the Squirm on Worms! Regular Composting is great! Worm composting is even better. Worms speed the composting process up and decrease the rate of Methane gas production. They also assist the breakdown of soil so that is high quality for gardening (loose and well drained). Plus worm composting is a lot less smelly! Want to know more about composting? Just ask! We will share our tips and secrets. Red Wiggler Worms are the best for composting. An earthworm like the Red Wigglers can consume ½ of its weight or more in a day. Worms love bread, grains, coffee grounds, ink free paper, fruits, tea bags, & veggies. 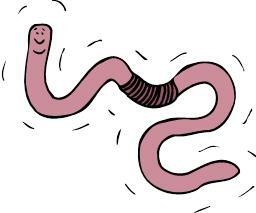 Worms do not like dairy, fats, meats, feces, or oils. Worms will multiply rapidly so check your bin for more worms in your compost. The more worms you have the more food & waste you will need to feed them. Worms like moist environments but they don’t like to get soaked. Too much water can be dangerous for them. Dirt is called grit for a worm. They eat this with their meals to help digest and breakdown food in their digestive systems.